We are Lyn and Sarah Gregory, and we are based in Goole in the East Riding of Yorkshire. We have a small kennel of English Springer Spaniels which we show, work, and breed. Our love affair with the breed began some twenty years ago when we acquired Sam, (Melton Rob Roy). Sam was shown with some success but it was in the field that he really excelled. 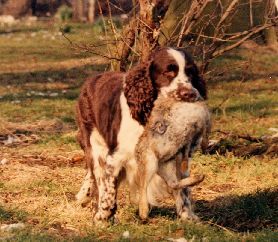 He won the Best English Springer Spaniel Novice Award at the Show Spaniels Field Day in 1986 and acquired his Show Gundogs Working Certificate in October 1985. Sam was a lovable chap, very easy to get on with, and as a first springer then you could not have found a better introduction to the breed. We were hooked. Our affix, Arcadia, was chosen because of the house that we used to live in. It was set in a very rural area, away from everything. Thus the word Arcadian which means "Rustic Paradise". Welcome then to our Rustic Paradise. We thank you for your visit, and hope that you enjoy meeting our dogs.